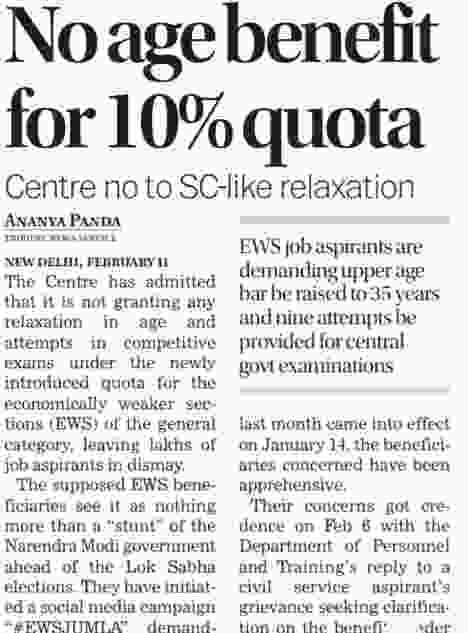 New Delhi, February 11, 2019: The Centre has admitted that it is not granting any relaxation in age and attempts in competitive exams under the newly introduced quota for the economically weaker sections (EWS) of the general category, leaving lakhs of job aspirants in dismay. The supposed EWS beneficiaries see it as nothing more than a “stunt” of the Narendra Modi government ahead of the Lok Sabha elections. They have initiated a social media campaign “#EWSJUMLA” demanding the upper age bar be raised to 35 years and nine attempts be provided in the Central government exams, including the Union Public Service Commission (UPSC) civil service, on a par with the Other Backward Classes (OBCs). Ever since the 10 per cent reservation for financially disadvantaged of the general category was announced last month came into effect on January 14, the beneficiaries concerned have been apprehensive. NOTE: We took this information from"The Tribune" Newspaper published on 12th Feb. 2019.